It’s taken a while, but Teenage Engineering has confirmed that its OP-Z synth will finally be released in October. We first got wind of it at the start of 2016, and there have been video previews since then, but only now have the final specs been confirmed. One of the reasons for the delay, we’re told, is that Teenage Engineering has reworked and re-thought the product significantly over the last year, but the company says that the OP-Z will be worth the wait. TE describes the instrument as a multimedia synth and sequencer. In fact, it’s billed as the first standalone 16-track sequencer that enables you to compose with music, visuals and lights on the fly. You may note that there’s no display; the thinking here is that you can use your own - an iPad, iPhone or computer – running the relevant app. 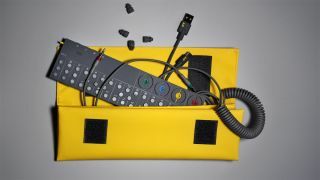 The OP-Z is portable and runs on batteries, and contains multiple synth engines, beats, samples, effects, visuals and preset patterns. It can control up to 16 lights via dmx, and offers unity 3d integration. There’s also a photomatic feature that enables you to instantly sequence photos taken on your phone. You’ll find an expansion slot, too - the first module will be released later this year, and more will follow. This being Teenage Engineering, you can purchase a range of accessories, including a leather case. It looks like pre-orders for the OP-Z have gone for now, but you can sign up on the Teenage Engineering website to be notified when more stock becomes available. No price is currently being listed, but reports suggest one of $599/€599.